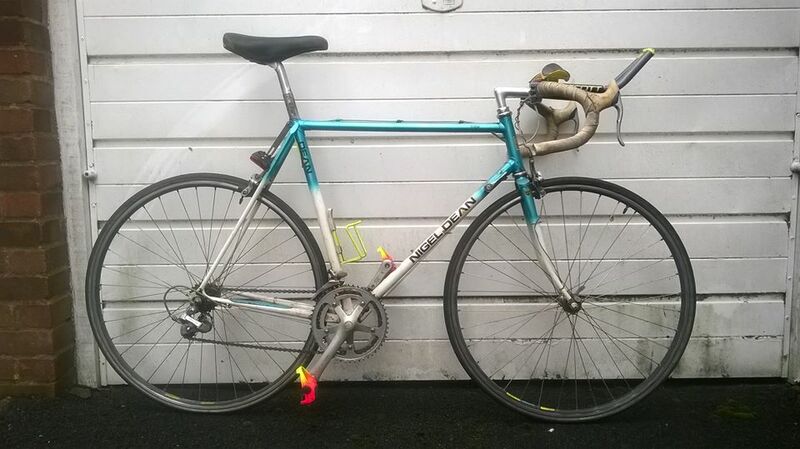 What Bike To Buy ? 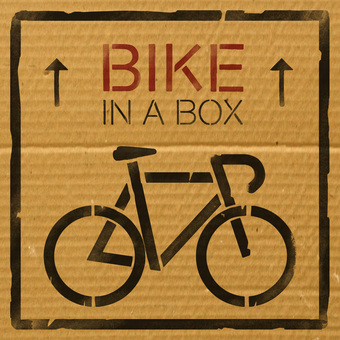 Well it always amazes me when I go onto the various cycling forums when I see people start a thread with the question asking what bike to buy ? And the really worrying thing in my mind is that these people are looking at spending over £500 , and I am sure I f I was in the market place for a new bike and was spending that kind of money I would like to think I would have an idea in my mind . Well i started the clean up work on the latest arrivals last night by fixing the puncture on the Carlton Corsair and swapping the flats for a pair of Sakae’s finest drops , after a quick evaluation ride all felt well apart from a wobbly back end . I used the Carlton for this morning commute just to get another 3 miles under its belt , rode well just need to sort out the mudguard to tyre contact that was not there last night . I dropped it down to my Local Bike Shop tonight for them to do there magic on the rear wheel , so fingers crossed . Tonight i have just de gunked the rear mechanism on the Nigel Dean and wiped the dust grime away from the rear sprocket , wheel spokes , hub and rim . The quill stem is rather stiff in movement so have given that a good soaking in plusgas and a few soft blow with the wooden hammer handle to try and loosen it up . 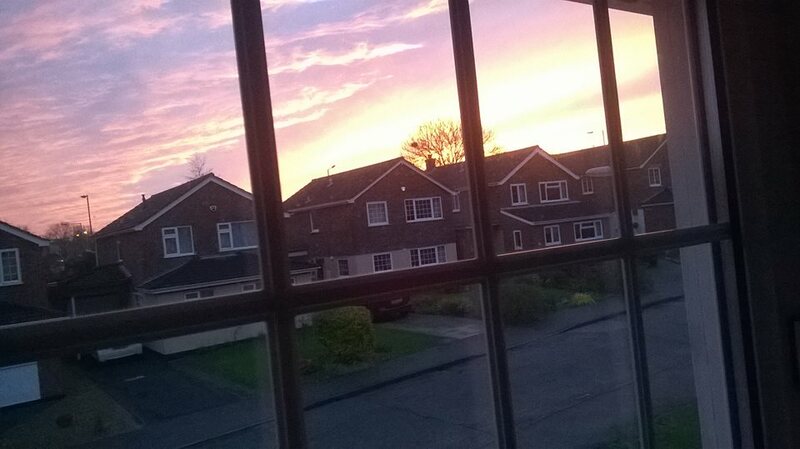 I did a post the other day re the sunrise from outside work , well tonight its the sun setting outside home that is the subject in question . Next stop was 6 miles away to find a very original Carlton Corsair that had belonged to the seller late grandad .The only change from original spec is a pr of blue pannier bags and a set of flat bars instead of drops so easily rectified . A good friend of mine loves his Harry Quinn bikes and could not help sharing his 2 latest framsets that he has ready for the next stage of there re build . The strange thing is that both are painted a lilac colour , one is a French Lilac (pink) whilst the other one is Crayola lilac because Crayola invented it as a colour . 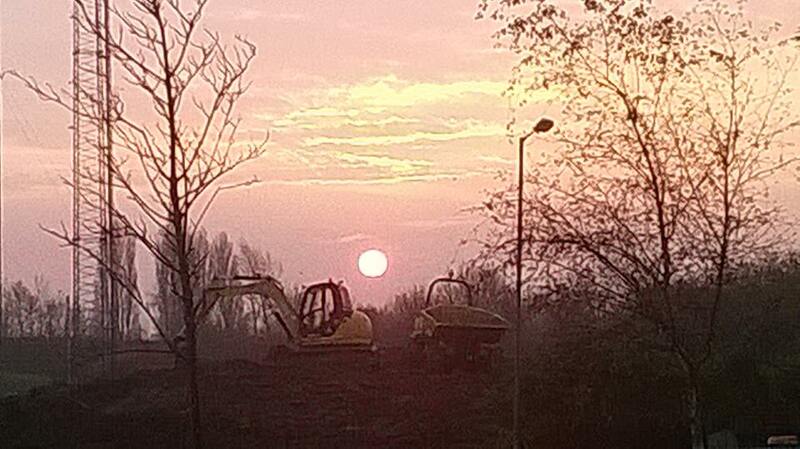 just across from where i work for the last week we have watched an army of ground workers and there associated machinery dig up and move the soil that was once a mound , we have no idea what they are actually aiming for . Viner Evolution Frameset with Oria Cromo ML 25 Main tubes and a Simoncini Pantographed Columbus Bicycle Tubes Touring fork set . 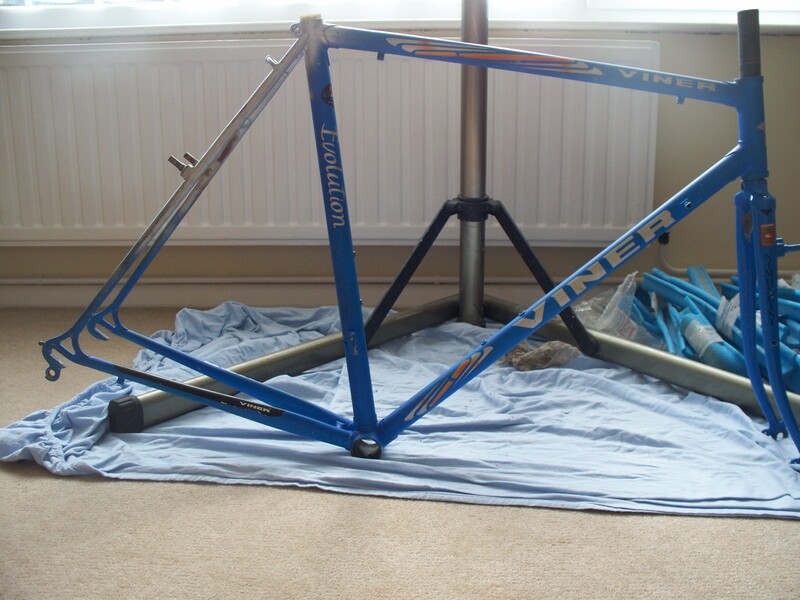 Its a 21″ or 53.5 cm sized frame measured from centre of Bottom Bracket hole and centre of seat pinch bolt . 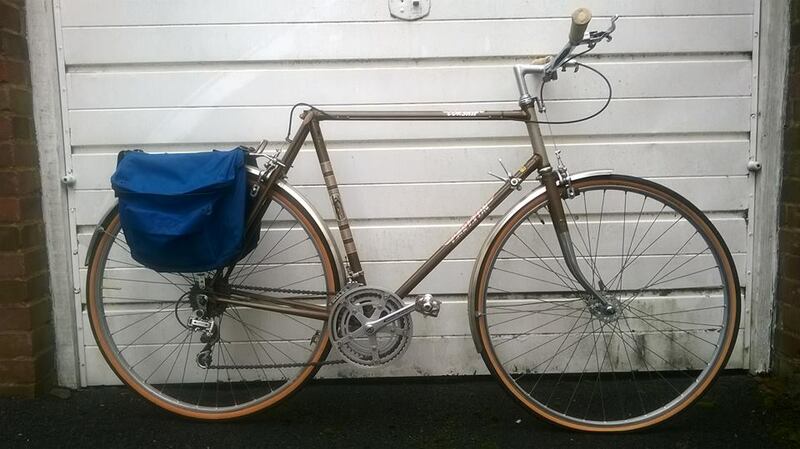 And is 21 1/2″ or 54 cm along the top tube , nice simple lugwork . Blue AND grey in colour that looks like a good polish / t cut would come up well . Some area of paint loss , worse of all on inside of forks . Takes cantilever style brakes , 2 sets of bottle cage mounts , braze on fr mechanism and a 27.2 mm seatpost . Fork is an 1″ A-Head type with what looks like an uncut stearer of 205 mm and 585 total length . . 130 and 100 mm dropouts . rear drop outs with micro adjustment and brake bridge . takes a 26.8 seat post and band on fr mech and has 1 set of bottle cage mounts . 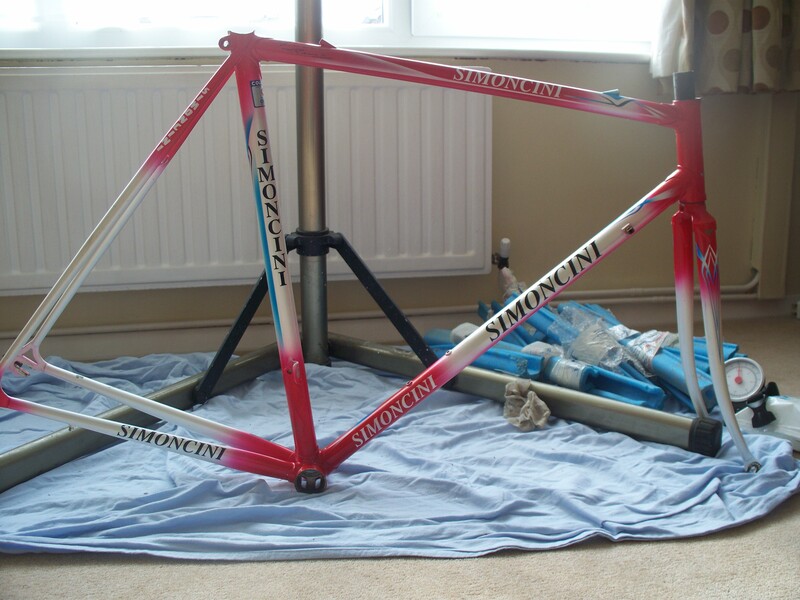 Simoncini Racing bike frameset made with Columbus Cromor Tubes , unsure of exact model it has a signature on it that i cant make out (see pics) . Its a 21 1/2″ or 54 cm sized frame measured from Centre of bottom bracket shell to centre of seat pinch bolt with Gipemme drop outs front & rear , cut away bottom bracket shell . 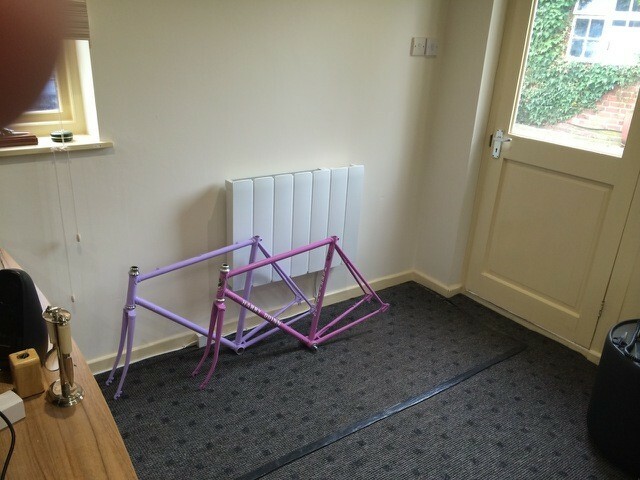 It measures 21 1/2″ or 54 cm along the top tube. Paintwork is a nice red and white fade scheme with contrasting decals that is in a very clean condition . Internal rear brake cabling along top tube , 1 x set of bottle cage mounts , takes a braze on fr mech , allen key type brake calipers and a 27mm seat post . Std 130 rr dropouts and 100mm fr dropout . 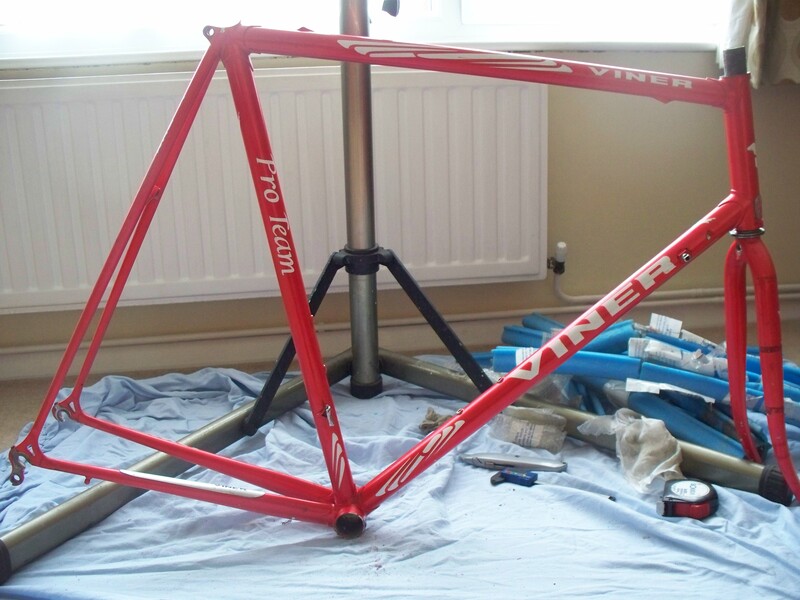 Viner Pro Team lugged Frameset 24 1/4″ sized frame from what i can make out is made with Dedacci zero tubing so nice and light . Paintwork is a nice bright red with contrasting decals and Viners anti scratch finish . Tubing looks to be slightly oversize to me , cut away bottom bracket shell . 2 sets of bottle cage mounts , fr mech hanger , internal rear brake trunking in top tube , allen key brakes and a 27.2 mm post size . 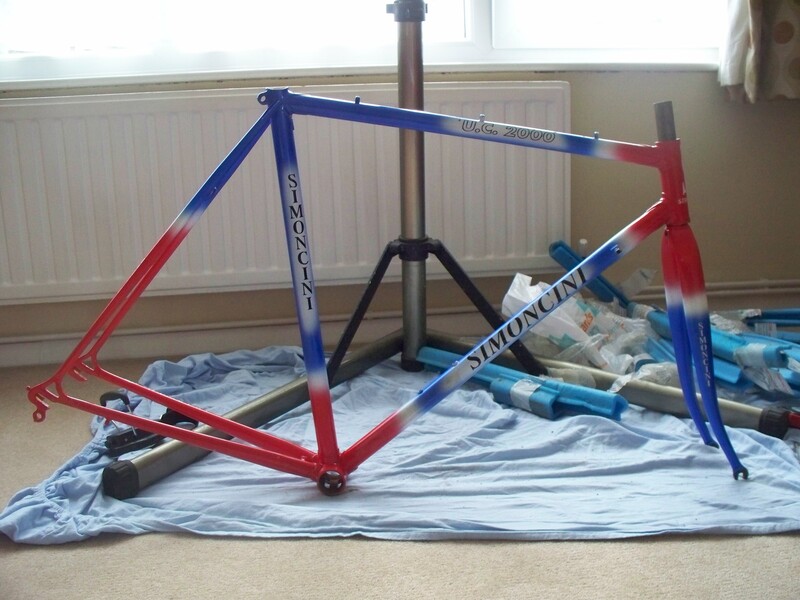 Slight paint fade on top tube , forks and rear stays but otherwise very clean , just wish it was a shade smaller for me .